The Neutrogena Light Therapy Acne Mask will revolutionize the way you treat acne. With clinically proven technology used by dermatologists, it clears acne and allows skin to heal itself. 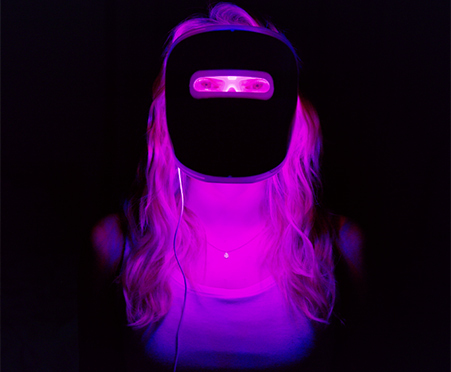 Blue light targets acne-causing bacteria while red light reduces acne inflammation. This one-step treatment covers your face and is easy to use at home. After cleansing, put the mask on. Push the button and let it work for 10 minutes. Then just sit back and relax until it automatically shuts off. Use it every day and you’ll see clearer, healthier skin with this 100% chemical free and UV free treatment. If you have any questions about the product or believe you may have experienced a side effect during use, or within 30 days after use of the product, please call the Consumer Care Center at 800-582-4048. Please provide activity # MK-160825092352-SAPR when you call.